Canadians who are veterans of the referendary battles in Quebec will watch with knowing sympathy as tension grips Scotland in the week leading up to the Sept. 18 referendum on independence. After many months of drowsy reassurance that the Scottish referendum was a mere formality, and that the separatists would be decisively rejected, most polls now show a slight lead for the secessionists. The British political establishment has been profoundly shaken from its complacent longueurs, and is scrambling around like beetles that have been blasted with insecticide. Prime Minister David Cameron has not pleaded with the Scots to "think of before voting to break it up," as Jean Chrétien infamously did in 1995, but the campaign isn't over yet. Some of the patterns between the two independence crises are very similar. The Union of the British and Scottish crowns, in James VI of Scotland who became James I of England, dates to the death of Queen Elizabeth I, the so-called "virgin queen" (a claim that is not insusceptible to doubt, but she was childless), in 1603. This was the year that Aymar de Chaste and Samuel de Champlain set up New France in Canada. The Act of Union, whose repeal is sought by the Yes side in the Scottish referendum, dates from 1707, when the two countries were amalgamated politically in institutions beneath the crown. At this point in Quebec, Frontenac had beaten off the Iroquois and the Americans, and the elder Vaudreuil was expanding the fur trade to Hudson's Bay, down the Mississippi, and across the Great Plains. The Scottish constitute only about 10% of the population of the United Kingdom, and there is no real language gap, though Gaelic sometimes is heard in the highlands, and there are a rich variety of comedic send-ups by, and of, all major regional and socioeconomic British accents. But the perceived or conjured threat of Scottish cultural survival is not really in play as it has been in Quebec. There was never a Scottish majority in Great Britain such as the French possessed in Canada until the 1840's. The British-Scottish Union was first by dynastic accident and then by legislation under the crown, unlike the military disposition of the French Canadians caused by the colonial operations of European armies and navies. Baldwin and Lafontaine, and then Macdonald, George Brown, and George-Étienne Cartier built a system of a double majority — a majority of both French and English-speaking Canadians — to approve important initiatives such as Confederation. Scotland never had the demographic strength or constitutional position to exercise such influence, and most Scots were assimilated almost seamlessly into British life. The fact that many British prime ministers were Scottish, including Alec Douglas-Home, Tony Blair and Gordon Brown, was scarcely noticed. To judge from their surnames, so, ultimately, were the families of Harold MacMillan and David Cameron, but it was never mentioned. Where the similarities begin is with the transfer payments and the grievances of exploitation: the notion of distinct nationhood abused by a majority taking more than it should from one region, which is incapable of defending its interests adequately in the existing political framework. In Canada, this claim by Quebec nationalists was made more plausible by the refusal of the Trudeau and Mulroney governments to reveal the precise extent of federal government disbursements in and to Quebec, and revenue collection in that province. Both leaders opposed "putting a price on Canada," presumably from fear of an English-Canadian backlash at the extent of the Danegeld being paid to Quebec nationalists. In Scotland, there is the predictable wild difference between the claims of the two sides about flows of money under the current regime and the costs and benefits of Scottish independence. As in Quebec, the Scottish separatists dismiss as of no consequence at all the various formalities in disentangling two nationalities after 400 years. Of course, they tell us, the queen would remain, the currency would be shared, and Scotland would remain in the European Union, but as an independent member. In reality, none of it is as clear as that. The queen's status, as the Union of crowns is not challenged, would not be in doubt at first. But Scotland would have to adopt a Constitution (and is pledged to do so), and the status of the queen or a republican alternative would quickly arise in that context. There is no reliable polling on the question publicly available, and there is no agitation against the queen, but she must surely be perceived as more English than Scottish, and if the Scots were to prove unenthused about having an English monarch, the status of that institution in more distant and foreign parts of the Commonwealth where it is not immutable, including Canada, would be seriously undermined. 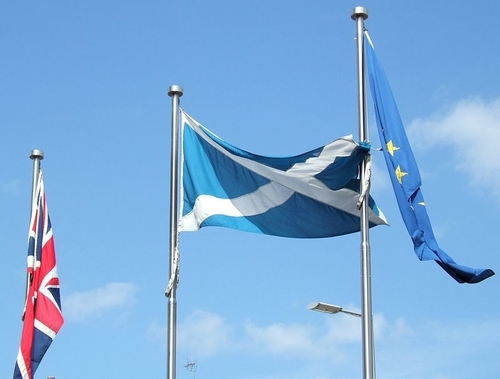 Scotland would not automatically be admitted to the EU. Britain could veto it. Moreover, new members now have to adopt the Euro, and it is not clear that the Scots, traditionally wise with money (though their recent performance as bankers didn't bear this out), would not necessarily leap with skirls of joy from the Pound to the Euro. If the tutelage of Britain has been too grating, they are unlikely to be enamoured of the devolutional techniques of Berlin and Brussels. Nor is it certain that the British, who have had an open fiscal artery in Scotland for decades, would wish to continue to provide Scotland a currency. The English left, as with the Anglo fellow travellers of the Quebec separatists, have fallen to defeatist ruminating. The Guardian newspaper, for instance, wonders if the UK would be thrown out as a permanent member of the United Nations Security Council. Of course, it would not. Russia holds the Security Council seat of the USSR, though it has only half of its former population; China remains though it has lost Taiwan; and France remains though it has lost its formerly largest province, Algeria. As in Canada, there are the predictable legions of British who want to see the back of the Scots. From the perspective of the rest of the UK, Scotland is costly and leftist, and the Labour Party would be hard put to win an election without sweeping most of Scotland as the Liberals long did in Quebec. If the Yes side wins in the referendum, all the party leaders — Prime Minister David Cameron, Labour's Ed Milliband and the Liberal-Democrats' Nick Clegg — probably are finished. They all have been asleep as polls moved these last weeks. They would not be a grievous loss to British public life. The Scottish Nationalists' blithe assumption that they will take 90% of North Sea oil is disputed by the British, and their assumption of the extent of reserves is more than twice the figure the British government estimates. The principal Scottish banks are in fact British, and though the Yes-side supporters deny it, they would certainly remove to London, taking many thousands of jobs with them. We have seen that movie in Canada, too, as René Lévesque, Jacques Parizeau, and Lucien Bouchard announced that these were empty threats while endless caravans of people and money, led by the Royal Bank and the Bank of Montreal, and including perhaps 800,000 people, decamped to Toronto and Ottawa over 40 years (and that was with the separatists losing in 1980 and 1995; we would have needed huge refugee centres if they actually had won). The British nuclear deterrent — four submarines carrying nuclear missiles — is now at Faslane in Scotland, and the United Kingdom does not have another port that would accommodate them as well, with deep water access so the ships surface only in port, and comparative remoteness. Probably they would be dispersed between Gibraltar and Portsmouth, but it would be an expensive move. At least the Scots did not try the sleazy Quebec tactic of a trick question that invited the voters to eat their cake with the assurance that it would remain in front of them. The question is stark: "Should Scotland be an independent country?" A prominent Quebec separatist, Jean-François Lisée, wrote last week in the Guardian that the British were conducting a fairer referendum than in Canada — though he tried to argue that the fault on this side of the Atlantic lay with Ottawa, not Quebec City for a confusingly worded question. The PQ's own leaders, Lévesque and Parizeau, wrote the referendum questions in 1980 and 1995; and in both cases, a question as clear as the Scottish one would have reduced the Yes total in Quebec by at least 10%. Unfortunately, the British, in their over-confidence, effectively have conceded that 50%-plus-one-vote for the Yes side is enough to remove Scotland from the UK, with only the formality of negotiations to confirm it. I warned my British friends in July to be wary of these separatists: They rise like a cobra at the end claiming "The whole race is being taken for granted," and if they lose they don't vanish — instead there is the unutterable irritation about the regime having squeaked out "a reprieve." But I believe they will lose, because, there as here, secession is a bad idea. Unfortunately, the Unionists have not emulated Pierre Trudeau, who ran a brilliant campaign in the 1980 referendum and was always confident but never over-confident, and have not learned from the near-disaster of Chrétien in 1995. Perhaps, if they do win, they will emulate Chrétien's brilliant Clarity Act of 1999, which redeemed his poor performance four years before. The Scots now have got the attention of Westminster and the City of London and have made their point. The Scots can count. The Union should win, but all is in play as we come down to the wire.